Santini stands at the mountaintop home of John and Margie Caraxini in Aibonito after delivering food and water. 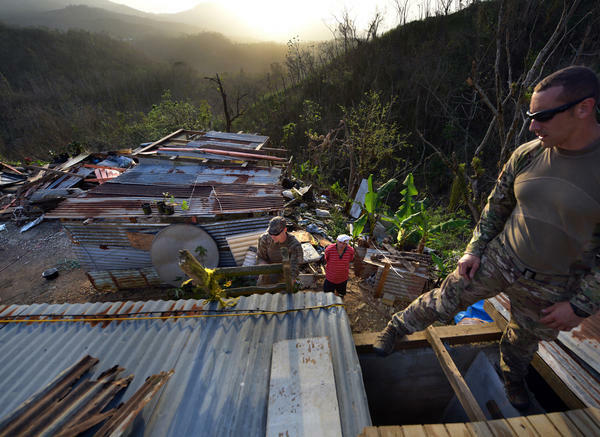 Evangelina Reyes watches as troops and volunteers repair her family's leaking roof. Kirk Thompson, a former Navy veteran, was very thin when troops arrived with food, water and a medical team. His road had not been cleared and he was cut off from supplies. A neighbor told Santini that he had given Thompson a package of hot dogs days earlier but had not seen him since. "It's all about networking," Santini said of his team's mission. 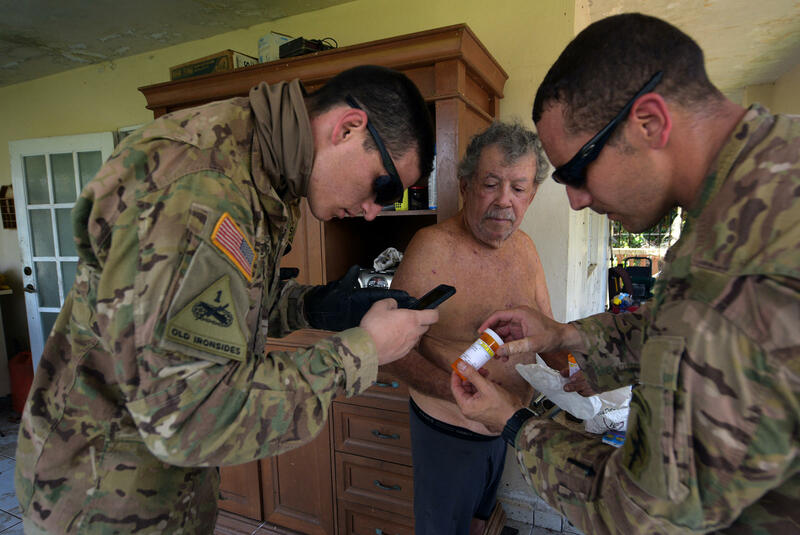 Rescue team members check on a resident's medicine. After this bridge collapsed, people made a sign that reads, "Community of the Forgotten." Santini's mission continues after darkness falls. He checks his list after delivering water to families. 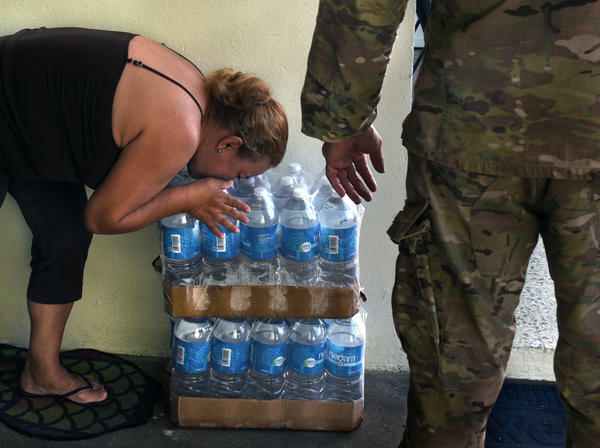 Iris Camacho, of Aibonito, kisses cases of water left by Santini. "Water is like gold around here," he said. 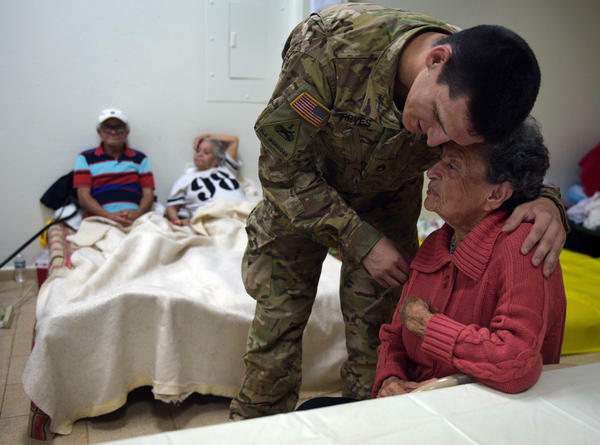 Teresa Colon of Aibonito hugs Staff Sgt. Eric Reyes. She has Alzheimer's and thought he was her grandson. He played along. On a satellite phone provided by Santini, Anthony Marrero speaks to his sons in the military at Fort Bragg for first time since the hurricane. Marilyn Ortiz Vasquez of Barranquitas has cerebral palsy and is cared for by her mother, Maria Vasquez Ortiz. Santini found medication and drove hours back to the home to give it to the family. 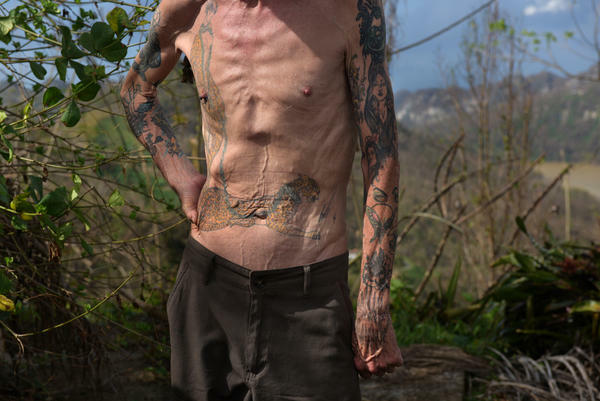 Benito Montabo, 78, hangs out on a bridge in Utuado. It's his "chill spot," according to Santini, who left water for him. Reyes hugs a tiny puppy at the mountaintop home of John and Margie Caraxini after delivering food and water. Caraballos thanks Santini as his wife and daughters stand in the doorway. 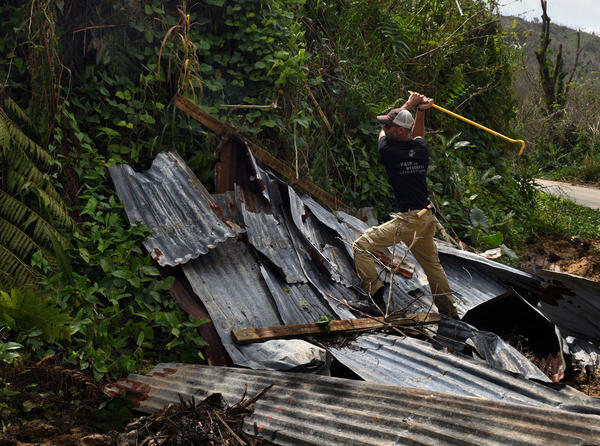 Daniel Braithwaite, a volunteer from Florida who is traveling with troops, gathers materials to repair Ruben Caraballos' leaking roof in Utuado. Sgt. 1st Class Antonio Santini and Maria Rivera in Aibonito, Puerto Rico. Santini and his team brought Humvees to Puerto Rico — but they were difficult to navigate in the island's terrain. Instead, they prefer all-terrain vehicles or the Jeeps they rented in San Juan. 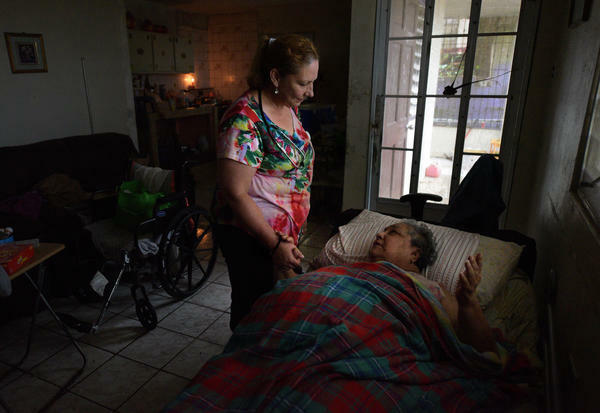 Rivera, a retired nurse, visits Miriam Negron, who is bedridden. Negron has no power or water and a bedroom that still floods. "We need to give them some hope," said Rivera. "These are the people who need us." 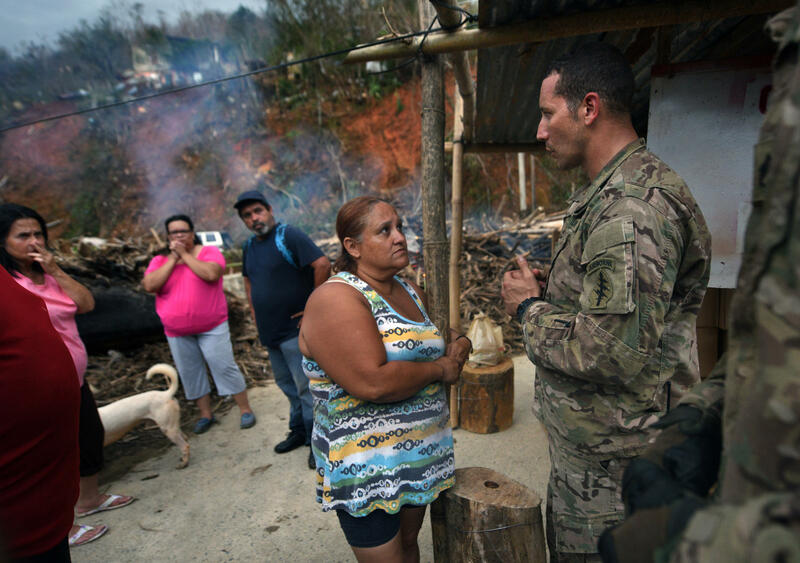 Santini speaks with hurricane survivors at a collapsed bridge in Utuado. Residents put up a sign saying "Community of the Forgotten," but as troops and volunteers brought food and water to the community, Santini told them they were not forgotten. 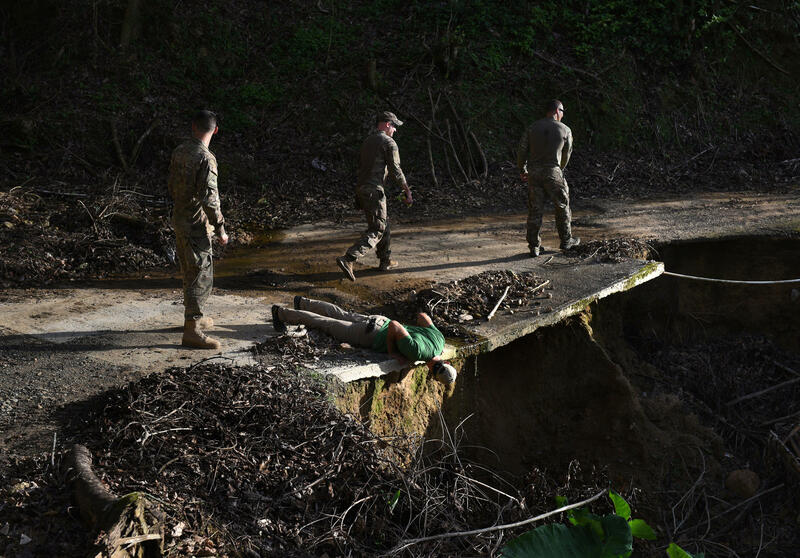 Timothy Bird (second from left), a volunteer with the nonprofit Crisis Relief Team, peers over a washed-out road to determine whether it is safe for the troops' Jeeps to pass. 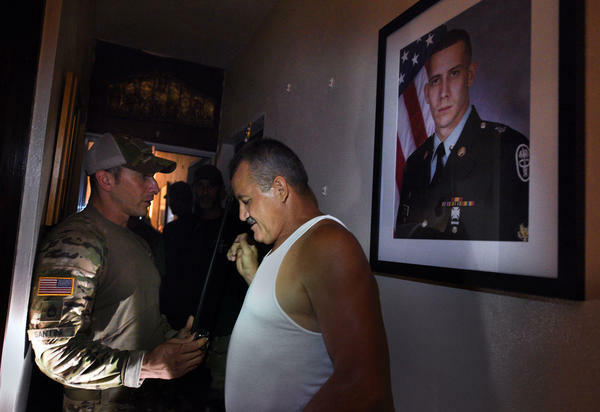 Santini surprised his family with a visit the evening after his troops completed a mission in his old neighborhood. He talks with his father, Tony Santini. Santini (right) and Sgt. 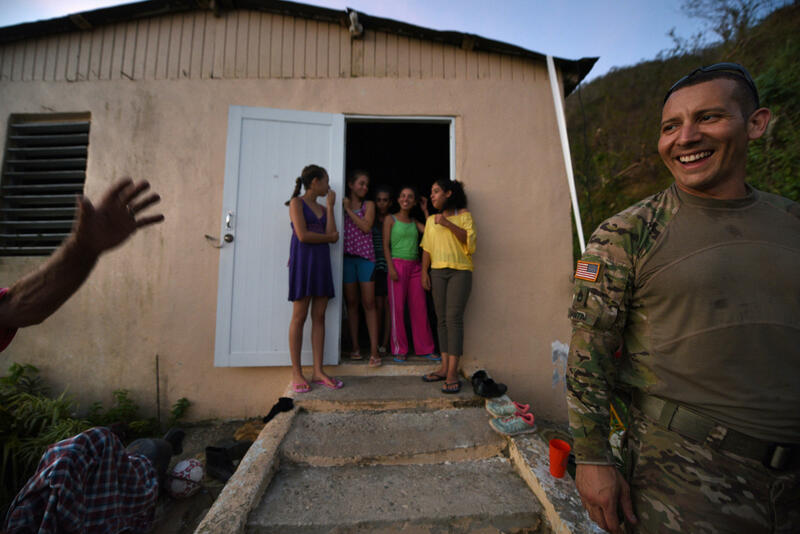 Kenneth McAnally with troops and volunteers from the Crisis Relief Team repair Ruben Caraballos' leaking roof in Utuado. Dr. Cheryl Chang, a volunteer from New York who rode with soldiers, examines Victor Santiago Hernandez. 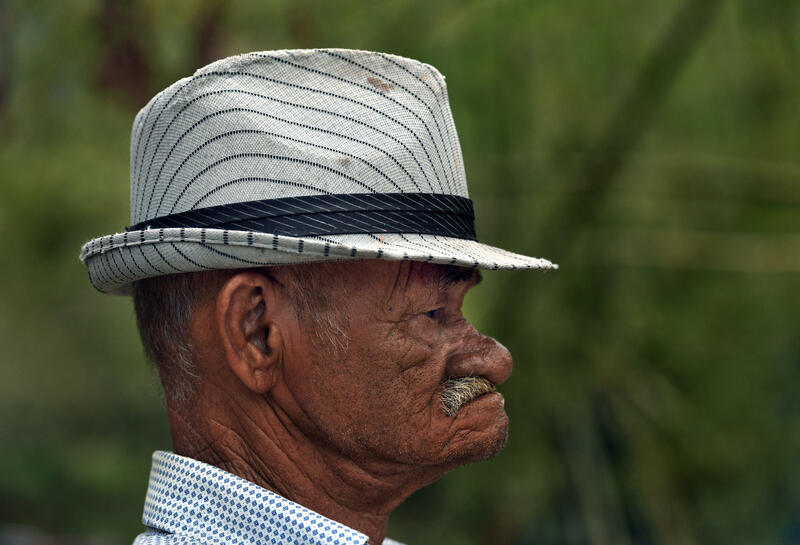 He and his wife both have dementia. 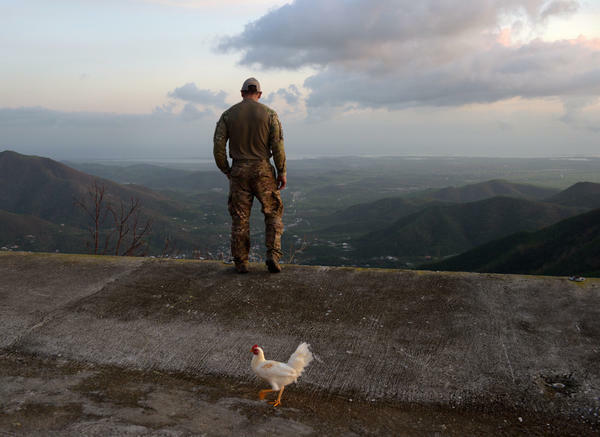 Antonio Santini was willing to do anything — as long he got to Puerto Rico. 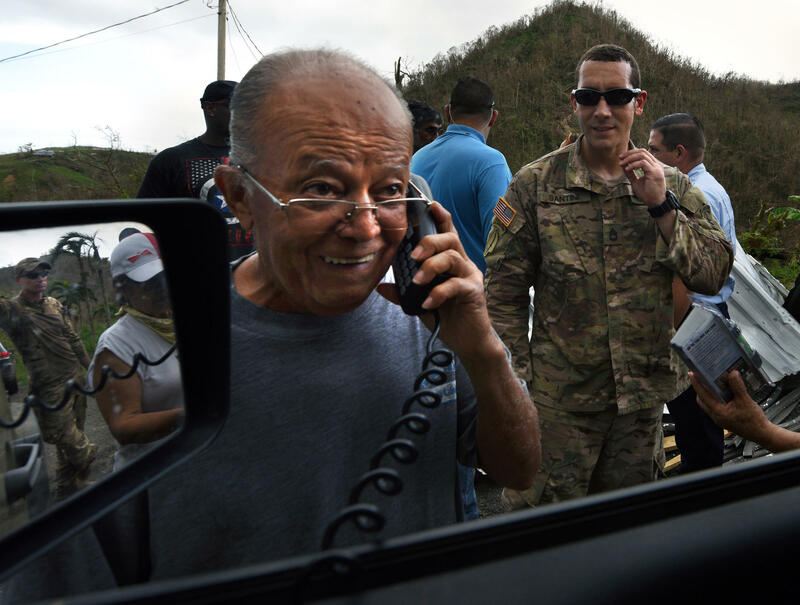 He'd be a perfect asset for the U.S. Army's Hurricane Maria mission: He spoke Spanish and he knew the terrain. The sergeant first class had been all over the world with the military — Germany, Peru, Qatar, Afghanistan — but this mission, to an island devastated by a Category 4 hurricane with 155 mph winds, was "deeply personal." 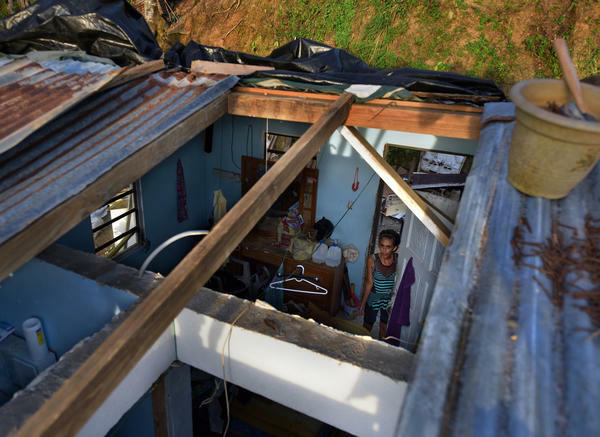 Fifteen hundred miles away, in the mountains of central Puerto Rico, Maria Rivera had survived the hurricane in her two-story house on the hill. Three generations of the family buckled down together as the whole house shook — the roof gave way, windows broke and water gushed in. Amid the storm's chaos, Rivera was calm. A deeply religious woman, she prayed for her family. For their house. For Puerto Rico. She and her husband stayed up through the night, bailing out water from the house. In the days that followed, while Santini was packing in North Carolina, making last-minute trips to the commissary on base at Fort Bragg, Rivera watched as their supplies dwindled and the water and power stayed off. Six days after the storm, Santini caught a Boeing C-17 with three dozen soldiers, headed for San Juan. When they arrived, they stayed on cots in the city's convention center — the staging place for most government entities like FEMA and the military. From there, Santini and his team loaded up their rented Jeep — the back filled with water, food and extra gas. With the stereo blasting heavy metal, they set off from San Juan for the mountains. Santini got behind the wheel because he "knows this island like the back of my hand." He and his crew traveled in a caravan with another Jeep carrying another Army team — a precaution Santini insisted on: "We're up in the mountains. If my vehicle falls off this cliff on this mountain, no one's ever gonna know where the heck we are," he explained, "two vehicles, so we can call in if something goes bad." 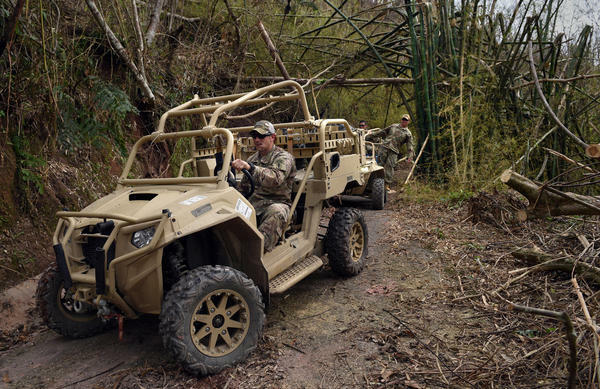 A part of the U.S. Army Special Forces, their main mission in Puerto Rico was to bridge communication gaps in isolated areas — to figure out what information still needed to be communicated and to whom. They flew down with a machine that could make 70,000 handbills in 24 hours, and as they traveled through the central mountain region they took notes and pictures to inform what gets printed in those pamphlets. Part of Santini's job was visiting with local leaders, letting them know what other mayors and distribution centers are doing — and what's working. There are 78 municipalities in Puerto Rico, and some had managed to make food and water available and get crews out to clear roads and help rebuild roofs and houses. As he navigated the windy roads, driving fast enough to make his passengers grip the door frames, he pointed out the brown landscape of dead trees. "This used to be super green," he said, tapping his hand on the steering wheel in rhythm with the music. The radio was tuned to a local salsa station because Pandora had lost service once they left San Juan. "Maybe by the time we leave it will be emerald again." The mountains have the coolest temperatures on the island. Those first few days after the hurricane, Rivera was grateful for having survived. But with no power, she and her husband had no air conditioning, plus there was no water or ice. "We didn't have nothing," she said. Phone lines and cell service were out, so there was no way to call, text or email their son in the States. He must have read the news, she thought. But still, she wanted to reach him. Her husband, Tony, wasn't worried: "I know he'll come. I know he'll come," he would repeat, wandering the house. 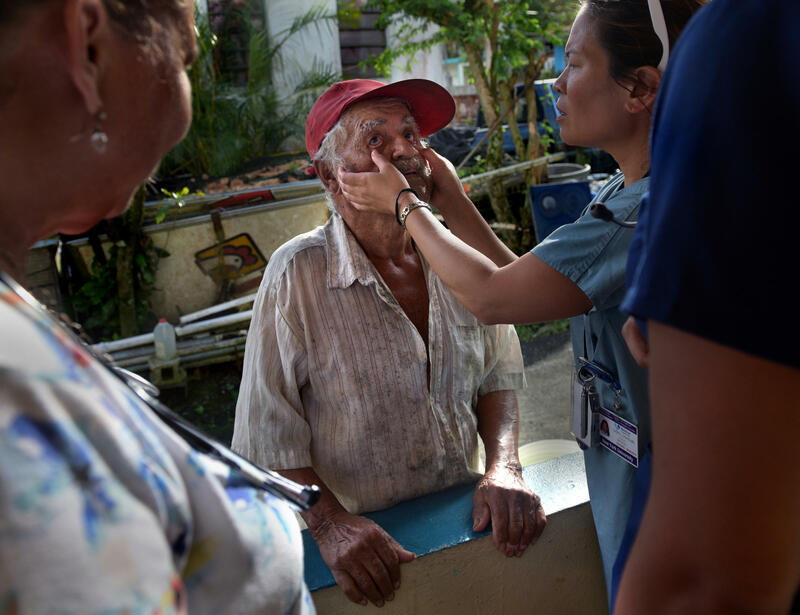 Rivera, a retired nurse, spent her days visiting bedridden neighbors who were unable to venture out to distribution centers. She and the other volunteers brought food and medical supplies like oxygen and insulin, if and when they were available. A few days after the storm she bought a deck of playing cards, and for days — that turned into weeks — she and her husband spent the evenings at the kitchen table by the door playing Roba Paquete. She guesses they played that game more than 100 times. They played and they waited. For food. For water. For communication with the outside world. In mountainous Aibonito, where the Riveras live, roads are winding and narrow. 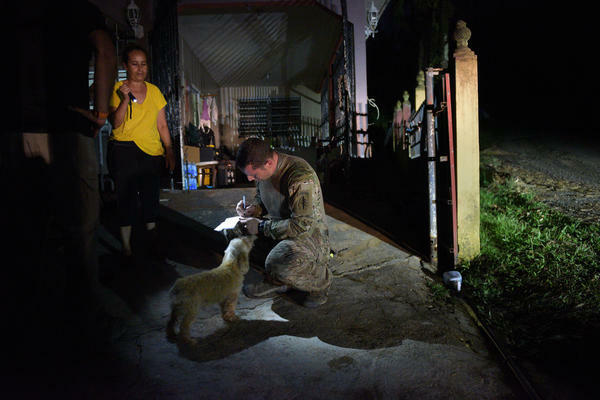 After Maria, many of those roads were impassable — flooded out, with downed debris and mudslides blocking the way. The problems in Aibonito were similar to those Santini and his team found two hours away in Utuado — washed-out roads, collapsed bridges, debris clogging small roads. "When those back roads got washed out, guess what?" he said. "Those communities got trapped." They planned to spend only a few days there but ended up staying for nearly a week. The main goal was information, but when the troops asked what people needed most, it was food and water. Santini says he didn't really believe the conditions before he saw it: "It was eye-opening. This is America. People shouldn't be freaking going hungry." 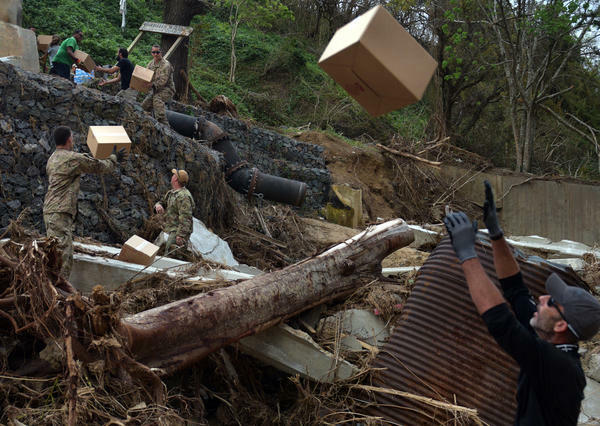 So they added some additional tasks to their mission: They brought food and water, and they chopped down trees and cleared roadways, which allowed the community to go to distribution centers, reach hospitals and clinics and buy supplies. They connected with firefighters, doctors and psychology professors. 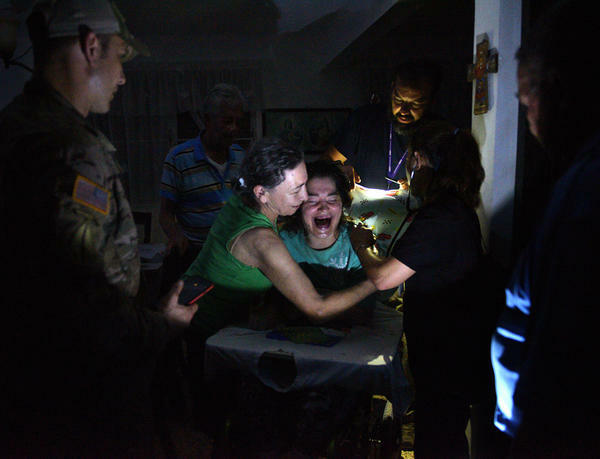 "It's all about networking," Santini said one night in San Juan as he chatted with two private citizens who had come down with diving gear, prepared to do search and rescue. The younger one was part of the so-called Cajun Navy that helped Houston after Hurricane Harvey. Up in the mountains, some projects were too big for Santini's small team to fix — but rather than just wait for a construction crew to rebuild a bridge, they fashioned a pulley system, with electrical tape fastened between two trees, several feet across the river. They slipped a plastic bucket on it, and voilà: a way to get food and water to the cut-off neighborhood. Doing this work gives Santini a great deal of pride. "I'm helping my people," he said, "the people of the mountains." Before the team finished in Utuado, Santini sat down with the local officials — including the mayor — to pass on the team's recommendations. The repairs were now in their hands. "You cross your fingers and hope that they follow through," he said, "because we have other communities that need help as well. Barranquitas, Aibonito ... there's a lot of work to be done." Nine days after the storm, exhausted from an afternoon of home visits, Rivera was doing what had become her evening ritual: playing cards. From her spot at the kitchen table, she had a perfect view of the driveway. She was about to win — when she heard a commotion outside. A revved engine. Then tire squeals. A fleet of Army vehicles rushed the house, almost crashing into her balcony. The first driver got out, leaving the car door swung open. It was Sgt. 1st Class Antonio Santini. Rivera threw her arms around him and started to cry. Her son had finally come home. "Mom, don't hug or kiss me too much, now's not the time," Rivera remembered her 38-year-old saying. "But that's something that we mothers can't help." Santini too held back his emotions — he hadn't heard any news from his family for nearly two weeks. "I was so relieved they were alive and OK," he said. "Seeing my parents so emotional, I just was so afraid I'd lose it in front of the guys." From the moment the storm hit the island, Santini had been waiting for this reunion. If the Army hadn't sent him here, he would have come himself, he says — along with his giant military-issued tough box filled with food, water, batteries, candles and tarps. But he was here on the job. He had work to do. "He brought us everything," Rivera told me a few days later, "but above all things, he brought his presence, and that calmed us a bit; knowing that we were reunited and that all was going to be all right." She pressed him for information — she knew so little about the rest of the island. He filled her in, sharing the stories from Utuado but leaving out some of the more devastating details. Rivera understood: "There are things he doesn't need to tell us; we can just look at him and know." Antonio Santini never imagined he'd be back here, doing this. He was born and raised in Puerto Rico, the eldest of three. "When I was younger, I lived through two hurricanes, but nothing like this," he explained. He went to college on the island, but when it came time to look for a job, "there was nothing." 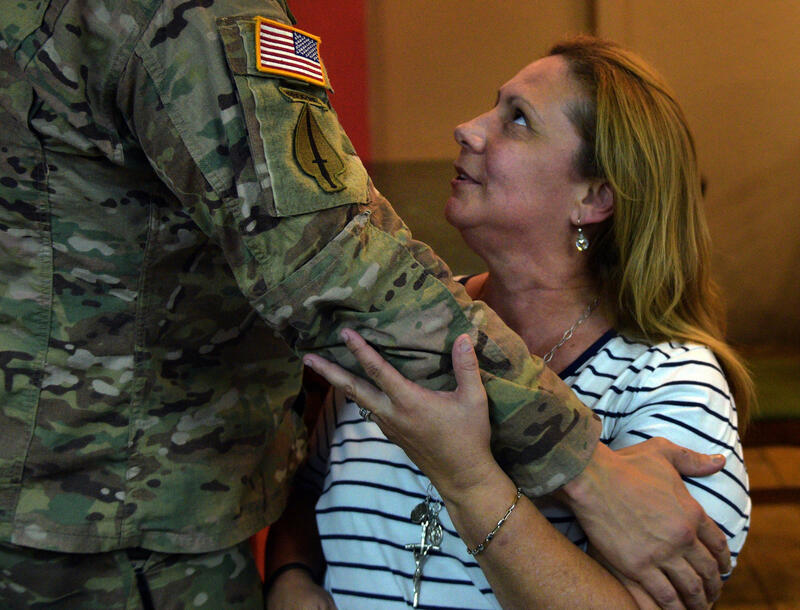 His mother suggested the Army — even called a recruiter to come to the house. 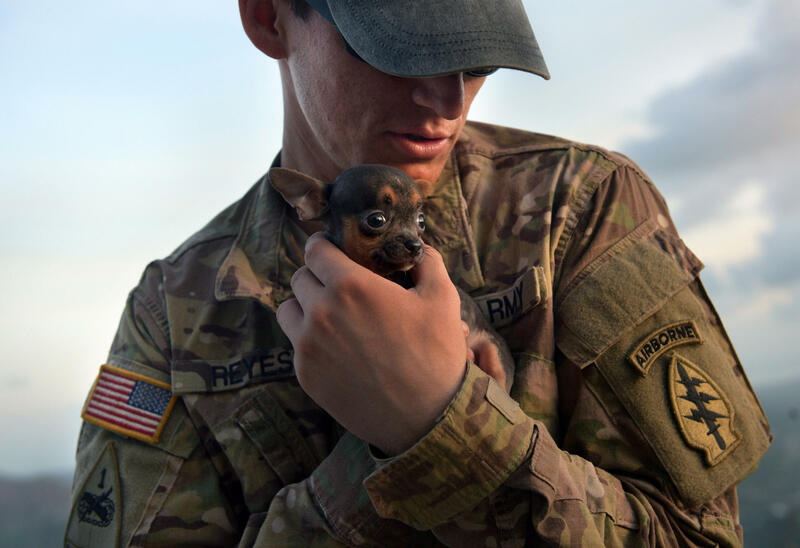 "When he graduated from his first year in the military we were so proud," Rivera said, "being able to see him be a part of the Army was immensely emotional." Santini's graduation portrait hangs behind her on the wall of their home, proof of a ceremony his parents missed because it was too expensive to travel at the time. Santini and his team continued their work in Aibonito, and other surrounding communities, feeling more confident about the recovery effort with each trip they took up into the mountains. 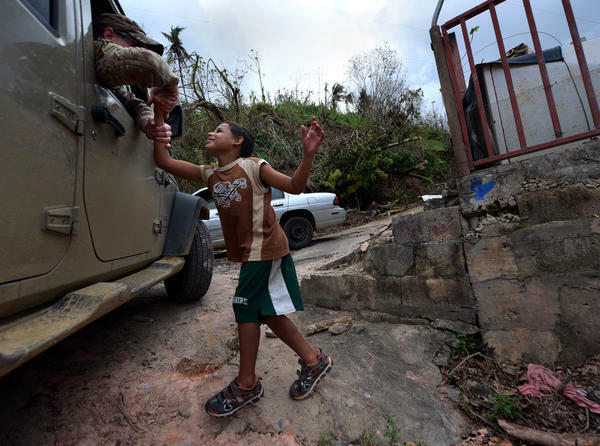 "Puerto Ricans are good people. We're resilient and patient and we'll wait until they figure it out," he said. A few minutes later he adds, "We're doing good work. We're helping a lot of people." He's constantly switches between both "we's" — the Puerto Rican people and the military. He's caught in the middle. He is both. It's a distinction his mother picks up on too: "When he's in uniform, he's another person," Rivera said, "but when he's home, he's a different Antonio." Seeing him in uniform, she said, is hard. "Me chocó un poquito," she said, roughly translating to "I was a little shocked." "It doesn't matter how many missions," she said, dabbing the side of her cheek as tears ran down. "These are things that one doesn't want to see with one's children." Over the next week, Santini and his team squeezed in several check-ins with his parents — usually while in transit to more isolated sites nearby. Santini arranged for a Friday night dinner at their house, and he invited the two teams of soldiers he was working with. He made one request: white rice with rabbit. His father is an expert at cooking rabbit fricassee. Knowing that her son is here on the island has been a comfort for Rivera, a marked change from her first days after the storm. But because communication is still down, she says his visits are bittersweet. Plans are hard to make — and even harder to change. "It's still not normal," Rivera said, "and we never know when will be next — or if this time is the last." Still, over the next few weeks they do see each other; sometimes planned, sometimes not. One night Santini and a bunch of soldiers stop for food at a restaurant in downtown Aibonito. As they're finishing their heaping plates of Mofongo, his mother and father walk in. There are more tears and hugging. Days later, Santini and his mother combine their separate missions, when he brings a doctor visiting from New York to Aibonito. They all spend the afternoon together, checking on the sick and the elderly. She was once a mirror image of her son, knocking on doors and bringing supplies. But on this day, they work in tandem. "It's paid off, knowing this place," Santini said reflecting on the past month on the island, "because we've been in the right place at the right time." As they worked their way through his old haunts, he frequently heard, "Oh, Antonio!" Exclamations from an old math teacher, a friend of his uncle, a woman who bought mangos from him when he was a kid. The ebb and flow — literally — of aid in Puerto Rico have, at times, baffled Santini. But this week, he sounds optimistic, ready to head back to Fort Bragg, feeling accomplished. "It's flowing," he said, "most people have food and water and the information gaps have been filled." People know what to do and where to go; in essence, his mission was accomplished. Except, Santini said, "there's a long, long road ahead."